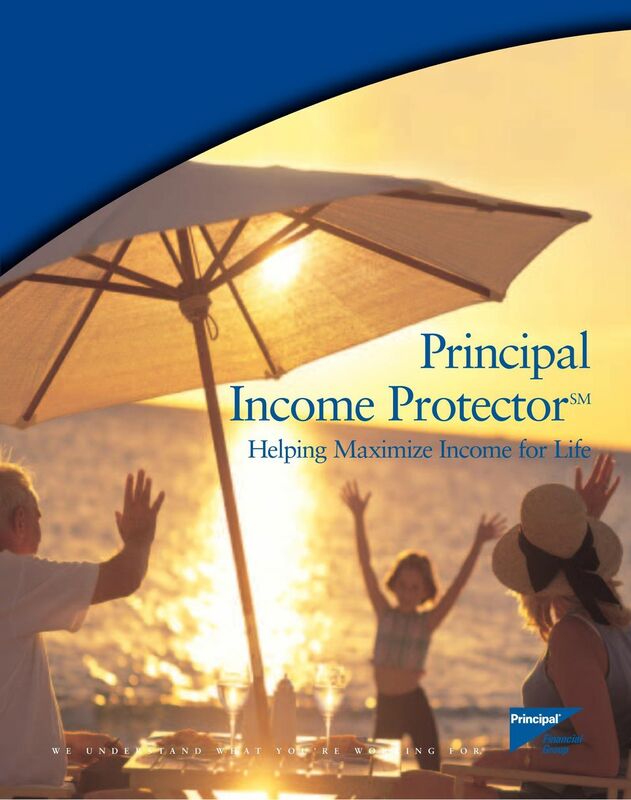 Download "Principal Income Protector SM Helping Maximize Income for Life"
1 Principal Income Protector SM Helping Maximize Income for Life W E U N D E R S T A N D W H A T Y O U R E W O R K I N G F O R.
2 What does retirement mean to you? Retirement means something different to each of us. Some of us want to travel. Some want to enjoy a new hobby. Some want to spend more time with family. Retirement also means the chance of running out of money. At age 65, you can expect to live another 20 or 30 years. 20 to 30 years to safeguard your savings against changing market conditions, rising medical expenses and the negative impact of inflation. Bottom line: the longer you live, the greater the risk you might outlive your savings. Don t let this happen to you. Make sure you have enough income to last through your retirement years. Take advantage of Principal Income Protector SM from Principal Life Insurance Company today. It s a new concept that helps maximize retirement assets, while securing a paycheck for life. 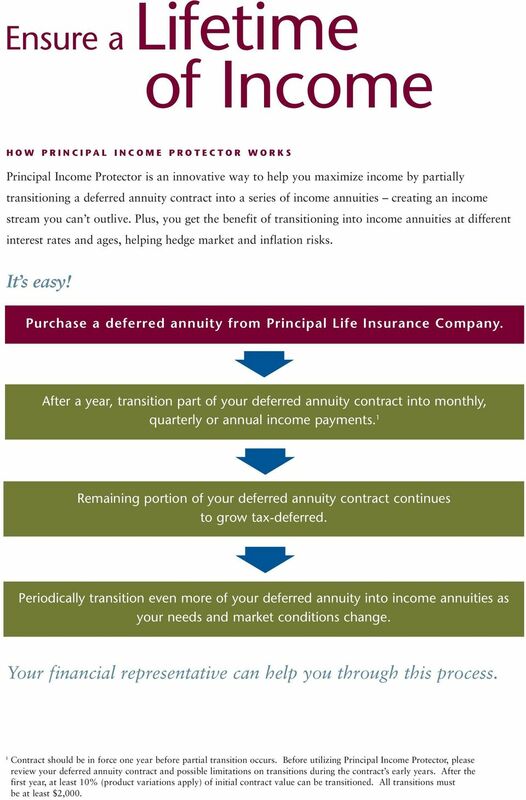 3 Ensure a Lifetime of Income HOW PRINCIPAL INCOME PROTECTOR WORKS Principal Income Protector is an innovative way to help you maximize income by partially transitioning a deferred annuity contract into a series of income annuities creating an income stream you can t outlive. Plus, you get the benefit of transitioning into income annuities at different interest rates and ages, helping hedge market and inflation risks. It s easy! 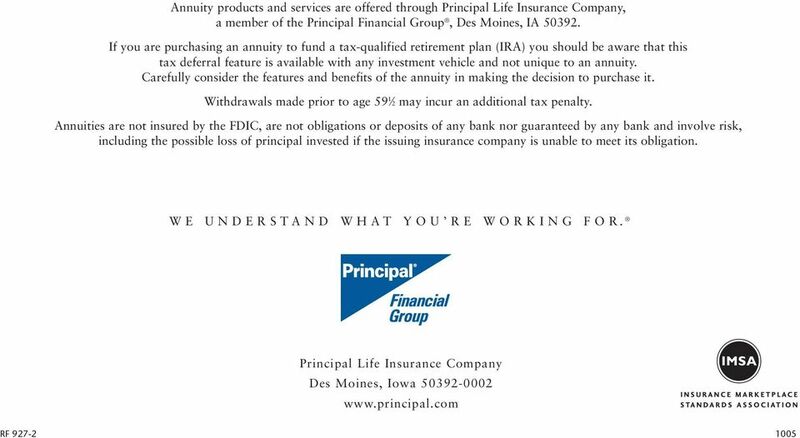 Purchase a deferred annuity from Principal Life Insurance Company. After a year, transition part of your deferred annuity contract into monthly, quarterly or annual income payments. 1 Remaining portion of your deferred annuity contract continues to grow tax-deferred. Periodically transition even more of your deferred annuity into income annuities as your needs and market conditions change. Your financial representative can help you through this process. 1 Contract should be in force one year before partial transition occurs. Before utilizing Principal Income Protector, please review your deferred annuity contract and possible limitations on transitions during the contract s early years. After the first year, at least 10% (product variations apply) of initial contract value can be transitioned. All transitions must be at least $2,000. 4 A range of income benefit options is a key feature of income annuities. You can choose who receives the payments and for how long. IS PRINCIPAL INCOME PROTECTOR RIGHT FOR ME? Principal Income Protector may be right if you: Are nearing or are in retirement (age 50 or older) Have concerns about how you ll meet your retirement income needs Want your investment to grow tax-deferred while you secure income for life Don t need all your income upfront and can wait a period of years before increasing your stream of income Have an initial lump sum investment ($20,000 or more) of either qualified or nonqualified money CHOOSING YOUR INCOME BENEFIT OPTION A range of income benefit options is a key feature of income annuities. You can choose who receives the payments and for how long. The following is a brief description of some of the most common ways to receive income annuity payments: Life Income Payments continue for your lifetime and end at death. This option is not available for clients over the age of 79. 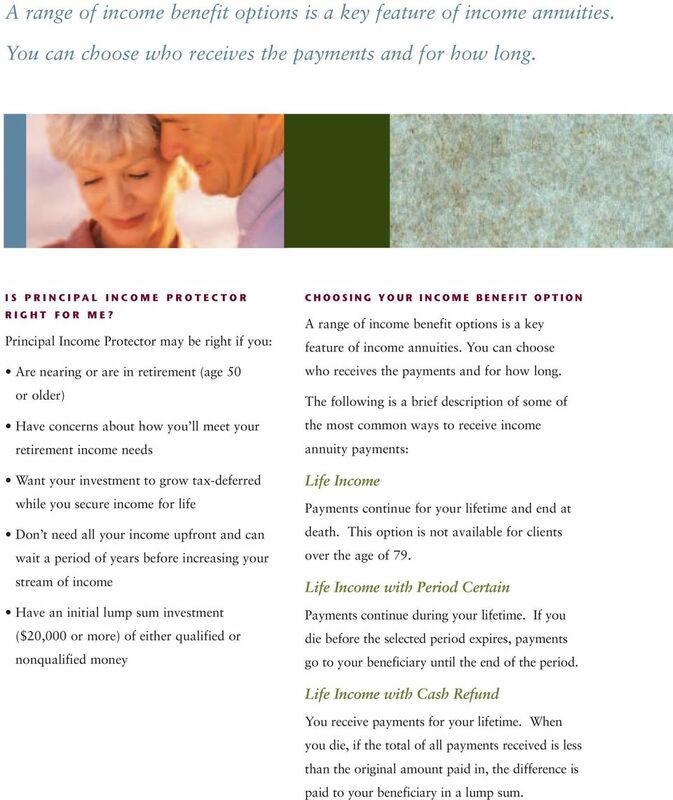 Life Income with Period Certain Payments continue during your lifetime. If you die before the selected period expires, payments go to your beneficiary until the end of the period. Life Income with Cash Refund You receive payments for your lifetime. 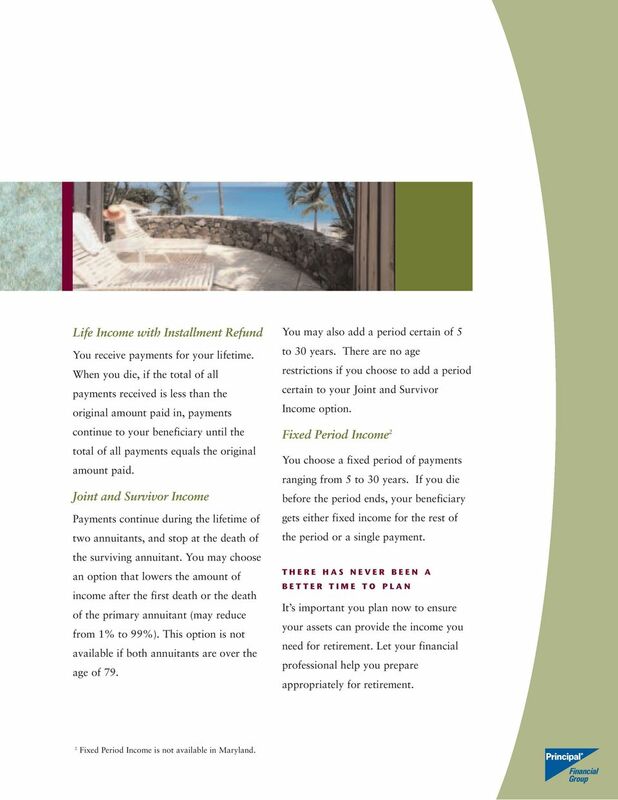 When you die, if the total of all payments received is less than the original amount paid in, the difference is paid to your beneficiary in a lump sum. 5 Life Income with Installment Refund You receive payments for your lifetime. When you die, if the total of all payments received is less than the original amount paid in, payments continue to your beneficiary until the total of all payments equals the original amount paid. Joint and Survivor Income Payments continue during the lifetime of two annuitants, and stop at the death of the surviving annuitant. You may choose an option that lowers the amount of income after the first death or the death of the primary annuitant (may reduce from 1% to 99%). This option is not available if both annuitants are over the age of 79. You may also add a period certain of 5 to 30 years. There are no age restrictions if you choose to add a period certain to your Joint and Survivor Income option. Fixed Period Income 2 You choose a fixed period of payments ranging from 5 to 30 years. If you die before the period ends, your beneficiary gets either fixed income for the rest of the period or a single payment. THERE HAS NEVER BEEN A BETTER TIME TO PLAN It s important you plan now to ensure your assets can provide the income you need for retirement. 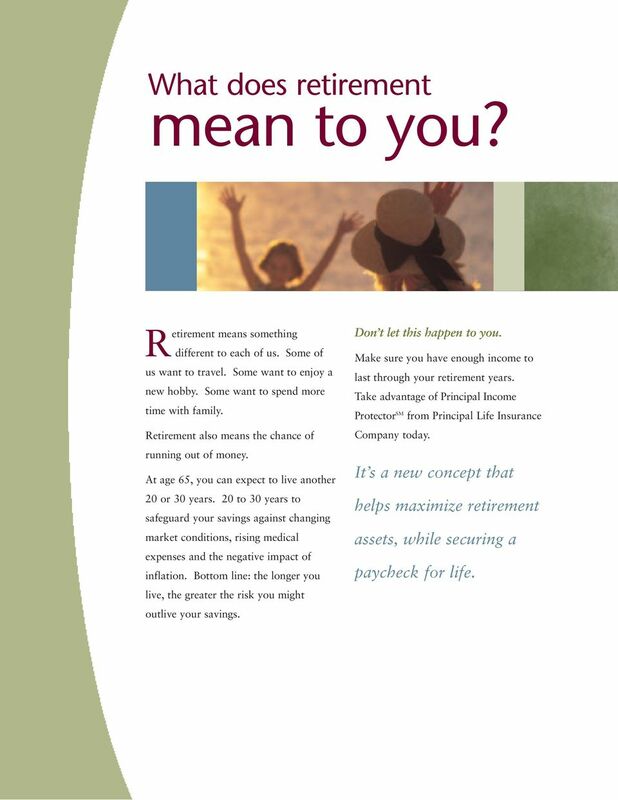 Let your financial professional help you prepare appropriately for retirement. 2 Fixed Period Income is not available in Maryland. MEMBERS Single Premium Immediate Annuity GUARANTEED RETIREMENT INCOME Move confidently into the future 10000256 REV 0508 TABLE OF CONTENTS 4 There are guarantees in life 5 What is an immediate annuity? If you have questions about this annuity, please ask your agent, adviser or contact a company representative at 1-800-541-0171. Annuities 101 What is an annuity Type of Annuities How to get started What is an Annuity? An annuity is a long-term (often 5 years or more), interest-paying contract offered through an insurance company. AGE 12. ANNUITIES, Plain & Simple. Income is the Name of the Game!